The new Bobcat M-Series compact excavators, currently available from Clark Equipment , are engineered to deliver greater strength in a lighter machine. Combining proven quality with new standards in performance and production, the M-Series features a range of enhancements that save time and labour, improve operator comfort, and provide greater peace of mind. Also known as mini-excavators, the Bobcat compact excavators are ideally suited to all types of earthmoving applications. 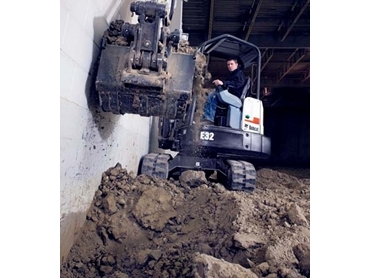 All models feature the exclusive Bobcat all-hydrostatic drive system and industry leading operator comfort. Thanks to the new Bobcat attachments, it is now possible to maximise the value of the investment and reduce the need for multiple machines. The exclusive X-Change mounting system (available on most models) makes it easy to swap between buckets or attachments that best suit the job at hand. It is possible to chose from multiple dig depths, three arm configurations, and three tail swing configurations.